Honeywell whole house humidifiers are a perfect way to add moisture to air in a home environment that is too dry and uncomfortable to breathe. If the relative humidity is below 30 percent, the air passages in your nose and lower airways in the lungs can become dry and irritated. In people prone to asthma, this can cause an asthma attack. Also, your skin can become dry and cracked, especially if you frequently wash your hands. In addition to causing an uncomfortable environment for people, air that is too dry can damage wood products including floors, cabinetry and furniture. Todays Concept has a series of Honeywell whole house humidifiers for sale at great prices. Whole house humidifiers, as opposed to portable ones which can humidify a room or two, connect directly to your furnace and work with your heating and cooling system to distribute moisture throughout your entire home. They either inject steam into the air or circulate it through a humidifying pad. 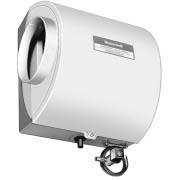 The Honeywell HE120A1010 whole house humidifier mounts directly onto your furnace and hooks to your water supply line to humidify your air as it is heated. During humidification, water supplied from your drain line flows evenly over an absorbent humidifier pad (included). Warm, dry air from your furnace then passes over the humidifier pad, picking up moisture during movement before it is circulated throughout your home. In addition to the humidifier units, Todays Concept has humidifier accessories for sale.